Lefranc, M.-P. and Lefranc, G., In: Molecular Biology of B cells, pp 37-59 (2004). The orientation of the human (Homo sapiens) IGL locus on the chromosome 22 (22q11.2) is forward (FWD). A, B, C refer to three distinct V-CLUSTERs based on the IGLV gene subgroup content . •	TOP3B (DNA topoisomerase III) (5' borne) has been identified 43 kb upstream of IGLV(I)-70 (P), the most 5' gene in the locus. •	RSPH14 (radial spoke head 14 homolog) (3' borne) has been identified 136 kb downstream of IGLC7 (F), the most 3' gene in the locus. 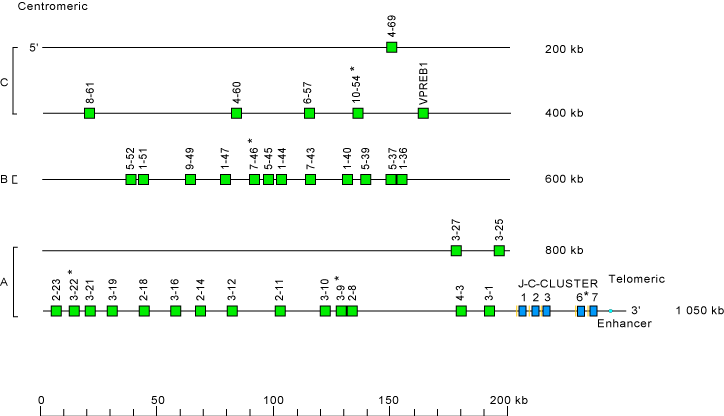 IGLV gene names are designated by a number for the subgroup [4,6] followed by a dash and a number for the localization from 3' to 5' in the locus. IGLV(IV)-66-1 has been identified in D87004 by IMGT curators (G. Folch, V. Giudicelli, M.-P. Lefranc). IGLV(VI)-25-1 has been identified in D86994 by IMGT curators (N. Bosc, M.-P. Lefranc). Gene localization is according to data from IMGT/LocusView. This locus representation with only the functional genes is used with IMGT/GeneFrequency. Frippiat, J.-P. et al., Hum. Mol. Genet., 4, 983-991 (1995). Kawasaki, K. et al., Genome Res., 5, 125-135 (1995). Williams, S.C., Frippiat, J.-P. et al., J. Mol. Biol., 264, 220-232 (1996). Kawasaki, K. et al., Genome Res., 7, 250-261 (1997). Hieter, P.A. et al., Nature, 294, 536-540 (1981). Taub, R.A. et al., Nature, 304, 172-174 (1983). Dariavach, P. et al., Proc. Natl. Acad. Sci., 84, 9074-9078 (1987). Vasicek, T.J. and Leder, P., J. Exp. Med., 1990, 609-620 (1990). Ghanem, N. et al., Exp. Clin. 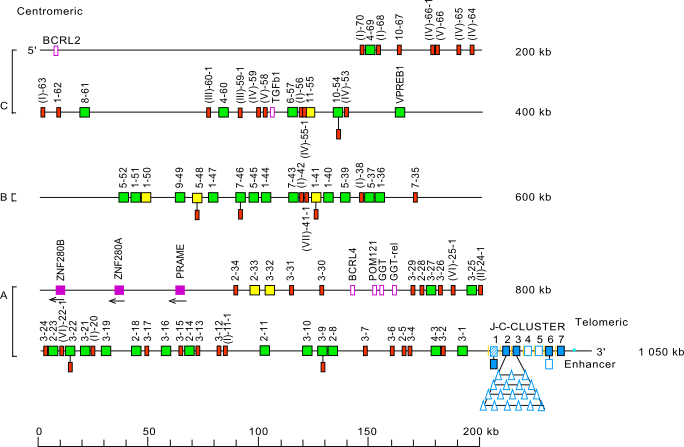 Immunogenet., 5, 186-195 (1988). Kay, P.H. et al., Immunogenetics, 35, 341-343 (1992). Lefranc, M.-P. et al., Hum. Genet., 104, 361-369 (1999). Blomberg, B.B. et al., J. Immunol., 147, 2354-2358 (1991). Asenbauer, H. et al., Eur. J. Immunol., 29, 713-724 (1999). Combriato, G. and Klobeck, H.G., J. Immunol., 168, 1259-1266 (2002).